This particular sandwich combines two of my favorite Louisiana treats – blackened fish and the po-boy sandwich. When making a po-boy, many consider the bread to be the most important part. It should be crispy and flaky on the outside, and soft on the inside. In New Orleans, bakeries make loaves specially designed for po-boy sandwiches. If you are outside of New Orleans, a classic French roll or baguette is the best option. As for the meat of the sandwich, the options are limitless. Roast beef with gravy, ham and cheese, fried seafood, and grilled fish are some of the most popular. It really up to the creativity of the cook. I like to use blackened fish on the po-boys I make at home. The main two reasons are that blackening is a really simple cooking technique and that it adds a delicious kick to an otherwise mild fish or meat. The key to blackening is the blackened seasoning. You can find blackened seasoning in the spice department at most neighborhood supermarkets. You simply dust the fish with a light coating of this dry seasoning and then cook it in a cast-iron skillet or on a grill. 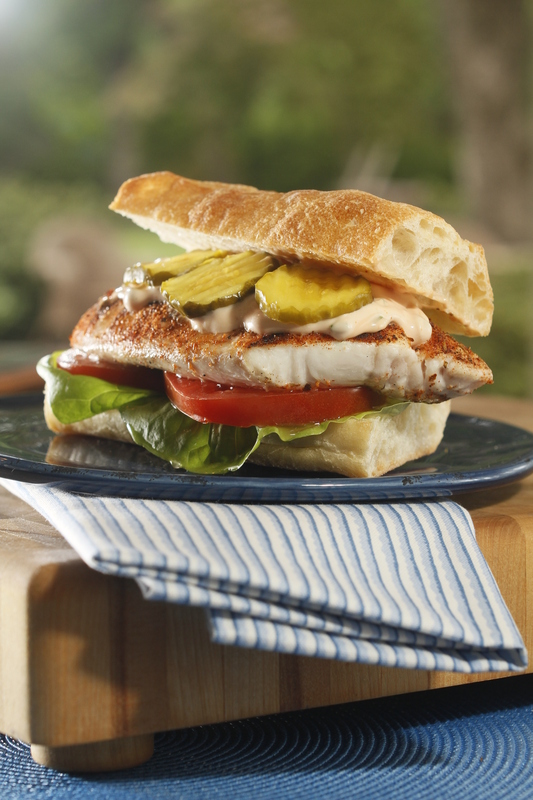 I typically use red snapper when I make this sandwich since it’s a Gulf fish often found on New Orleans menus. Any firm white fish, like tilapia or grouper, can easily be substituted for the snapper. I like to dress my po-boys with the classic lettuce, tomato, and pickle as well as a spicy remoulade sauce. To make the remoulade sauce: In a medium mixing bowl whisk together the mayonnaise, ketchup, and lemon juice. Season to taste with salt and pepper. Stir in the scallions. Cover and refrigerate until ready to serve. To make the blackened snapper po-boy: Season both sides of the fish with the blackened seasoning. In a large skillet over medium-high heat, warm the oil until a few droplets of water sizzle when carefully sprinkled in the pan. Sear the fish on one side until the meat is well browned and releases easily from the pan, about 4 to 5 minutes. Turn over the fillets and cook until desired doneness, about 5 more minutes. About 1 minute before the fish is done, lightly toast the rolls. To serve, spread remoulade sauce on the top and bottom of each roll. Place the fish on the bread and garnish with the pickles, tomatoes, and lettuce. Don’t like it spicy? Just omit the blackened seasoning and season your fish with salt and pepper. This fish can be cooked on a grill. 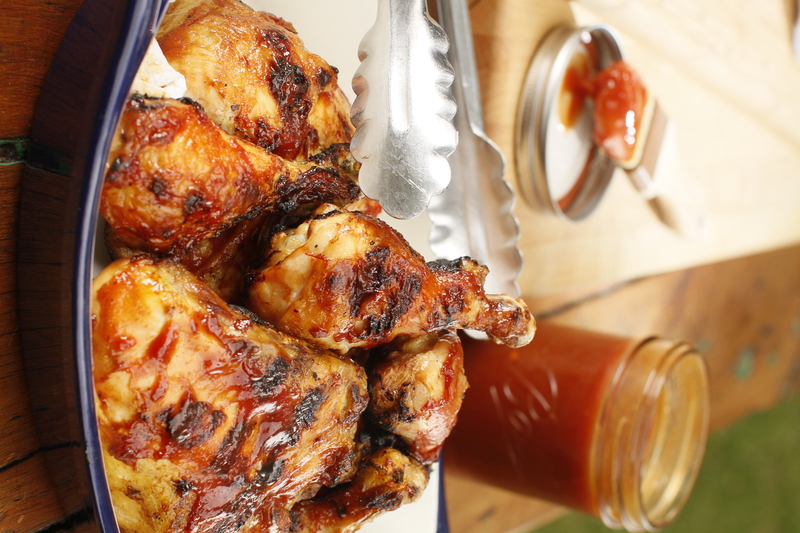 You don’t have to be a pitmaster to make finger-lickin’ good barbecue chicken. These tips and tricks will have you mastering the grill like a pro. First, start with the sauce. Whereas bottled sauces are a tasty convenience, homemade sauces can be much tastier. Surprisingly easy to whip up using pantry staples, homemade sauces have a fresher and brighter flavor than their packaged counterparts. 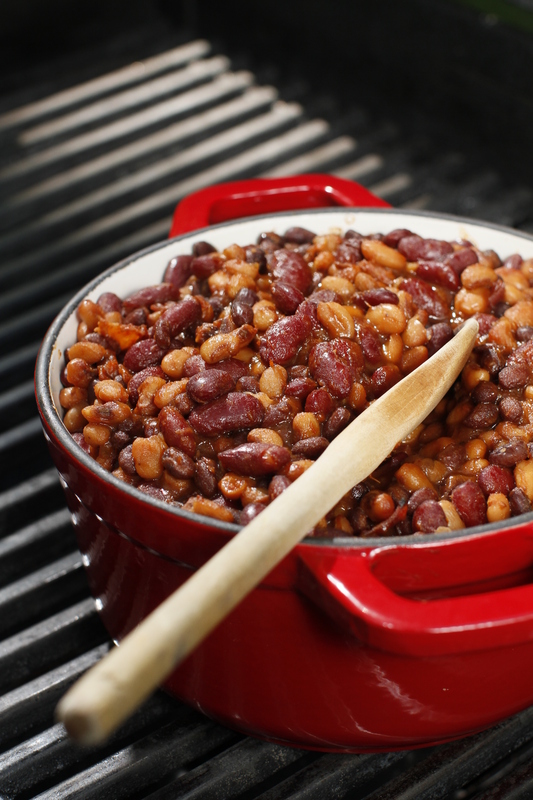 The recipe below is a basic barbecue sauce. But you can doctor it up by adding ingredients like honey, hot sauce and even bourbon to make your own signature sauce. When preparing your chicken for the grill, be sure to let the meat stand at room temperature for about 30 minutes before putting it on the grates. Taking away the chill will help your chicken cook more evenly and quickly. For a boost of flavor, an easy trick is to season the chicken with a spicy dry rub instead of just salt and pepper. Brushing the chicken with a little oil before adding the rub will not only help the rub better adhere to the meat but will also help prevent sticking on the grill. Two-zone grilling is especially helpful for cooking foods like bone-in chicken. Sear the chicken first over direct heat and then move it to an area with no heat to finish cooking by indirect heat. To create an indirect heating zone on your gas grill, simply turn off the burners on one side. For a charcoal grill, place the hot coals only on one side of the grill. Also, closing the lid is essential when using indirect grilling. A closed lid helps the grill mimic an oven and evenly cook the chicken. Finally, the key to perfect barbecue chicken is to apply the sauce when the chicken is almost done. This prevents the sauce from burning. In a large saucepan combine the ketchup, water, vinegar, brown sugar, molasses, red pepper flakes, onion powder, dry mustard, and Worcestershire sauce. Over high heat, bring the sauce to a boil. Reduce the heat to medium-low and simmer, stirring occasionally, until the sauce thickens, about 20 to 25 minutes. Measure out 1 cup of sauce. Refrigerate the remaining sauce for another time. In a small bowl combine the paprika, chili powder, garlic powder, 2 teaspoons salt, and 1/2 teaspoon pepper. Brush the chicken with the olive oil. Generously season the chicken with the dry rub. Place the chicken on the grill. Close the lid and cook, turning once or twice, until no longer pink in the middle, about 12 to 15 minutes per side. During the final 5 minutes of cooking, baste the chicken with the barbecue sauce. Remove the chicken from grill. The Photo was taken by the talented Justin Fox Burks. 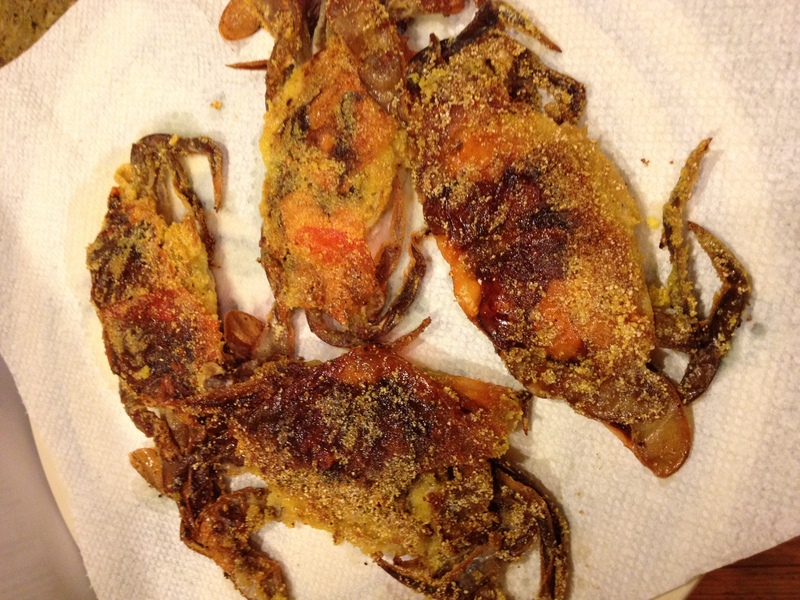 Soft Shell Crabs … if you have never had them, now is the time to give them a try! Soft shell crabs are one of my favorite treats. They are only available for a couple of months each year – usually late April through June or July. Soft shell crabs are crabs that have just molted. Their shell is soft … allowing them to be eaten whole. No more need to pick out that coveted meat from a hard shell! Soft shell crabs fresh from the Gulf are now available. I picked some up last weekend at my local farmers market. Each week Paradise Seafood drives fresh Gulf seafood up from the coast to sell at the Memphis Agricenter Farmers Market and the Memphis Farmers Market downtown. Living in Memphis, we are lucky that the Gulf coast is within driving distance. If you live no where near a coast line, no worries. You can find soft shell crabs throughout the country at gourmet seafood markets. Just ask your fishmonger. Soft shell crabs are ideally purchased live so they are at their freshest. Store live soft shell crabs uncovered in the fridge over a bed of wet paper towels for no more than one day. Live soft shell crabs will need to be cleaned. It is a really simple process but a necessary one. Cooking Light Magazine has an excellent post with step by step instructions. Click here. If you do have to buy frozen crabs, they have probably already been cleaned. Defrost them overnight in the refrigerator before cooking. Fresh is best but the frozen ones are a close second. I find the best way to enjoy this seasonal treat is sautéed with a simple dusting of cornmeal. No need for a deep fryer or heavy batter. Whip up a quick homemade remoulade sauce and from start to finish your soft shell crabs can be on the table in less than 30 minutes. In a medium mixing bowl whisk together the mayonnaise, ketchup, and lemon juice. Season to taste with salt and pepper. Stir in the scallions. Cover and refrigerate until ready to serve. Season both sides of the crabs with salt and pepper. Place the cornmeal in a shallow bowl. Working in batches, lightly dredge both sides of the crabs in the cornmeal, shaking off the excess. In a large skillet over medium-high heat, warm the oil until a few droplets of water sizzle when carefully sprinkled in the pan. Sear the crabs on one side until lightly browned and soft, about 2 to 3 minutes. Turn over the crabs and cook until desired doneness, about 2 to 3 more minutes. Serve warm with a spoonful of the remoulade sauce. Do-Ahead: The remoulade dipping sauce can be made up to 3 days in advance. Cover and refrigerate until just before serving. If you like a little kick in your food, blackening should be in your cooking repertoire. It is so easy. It really isn’t a cooking technique at all … but instead is the use of a spicy seasoning. Delicious on fish or chicken, I like to generously season the meat with the blackened seasoning and then either sear it in a skillet over the stove-top or grill it. 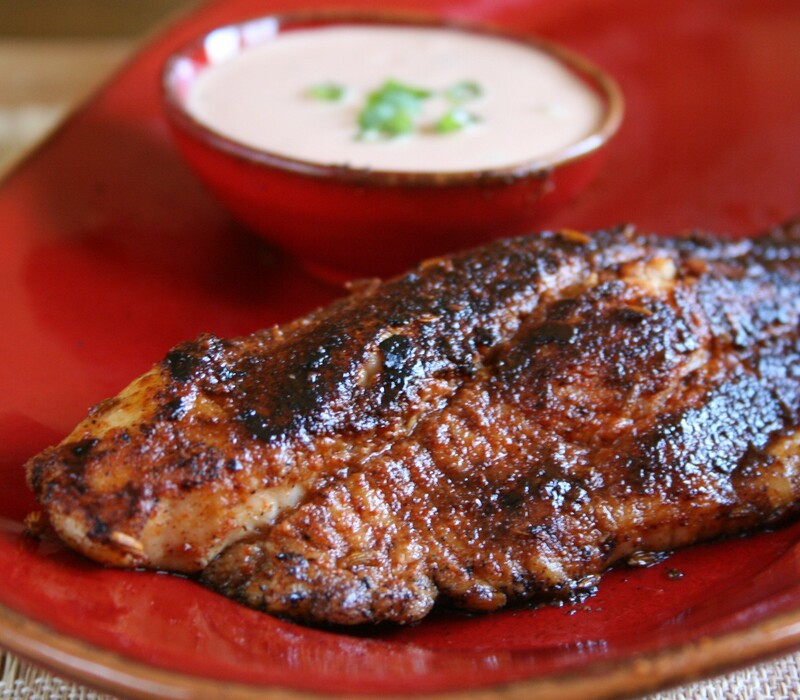 This recipe is the basic technique for blackening fish. Feel free to substitute chicken or your favorite fish for the catfish. Tilapia, salmon, and swordfish all taste delicious blackened. In Memphis (my hometown), Soul Fish Café may be known for its fried catfish, but my favorite item on their menu is the blackened catfish. This is my homemade version along with the not-so-traditional remoulade they serve on the side to cut the heat. Season both sides of the fish with the blackened seasoning. In a large skillet over medium-high heat, warm the oil until a few droplets of water sizzle when carefully sprinkled in the pan. Sear the fish on one side until the meat is well browned and releases easily from the pan, about 4 to 5 minutes. Turn over the fillets and cook until desired doneness, about 5 more minutes. Serve warm with a spoonful of the remoulade dipping sauce.